My husband and I shared our first Valentines together and in order to make it special I obviously had to revolve the day around food. 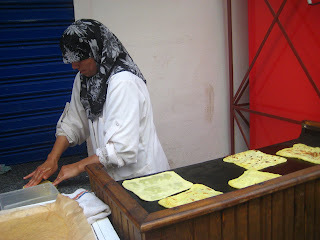 I decided to make Msemen for breakfast, a "crepe" like flat bread that we had for breakfast each day on our honeymoon in Morocco. I make us each 2 just like we had there- one smothered with nutella and folded up, the other "fromage" with laughing cow's creamy swiss cheese. I decided to mix things up and threw some scrambled eggs in the cheese one. For lunch I attempted to recreate one of our favorite meals from the Utah County days, Lomo Saltado (served with Papa a la Huancaina sauce). We frequented a wonderful Peruvian hole-in-the-wall restaurant called "El Rinconcito del Inca". It was basically a make-shift restaurant in a peruvian family's basement with no more than 5 tables. Everyone who worked there was part of the Peruvian family, except this one random Scandinavian who spoke little English, I never did figure out his role there, but it just added to the quirky uniqueness of the location. I've driven past there several times since they took their sign down, I wish I knew what happened to them... I've got the sauce down though. 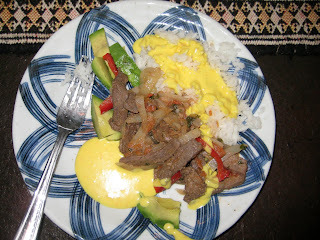 (learned to make Aji-de-Gallina and Papa-a-la-Huancaina while living in Chile with a Peruvian.) The Lomo Saltado sauce also had the flavor right, but I think I the meat would have been softer if I had time to marinate it longer. And then there was dinner. 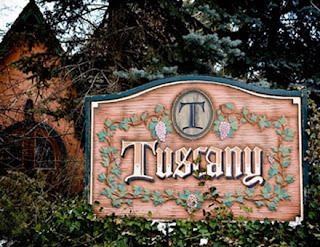 Almost daily I drive past Tuscany, this beautiful restaurant in a Chatoe-esque fancy builiding just down the road from us. I see candles lit on talbes by the window, and I envision getting dressed up and enjoying some exquisit meal there with my husband. So as Valentines and our 1/2 Anniversary approached, it was definitely in the running. 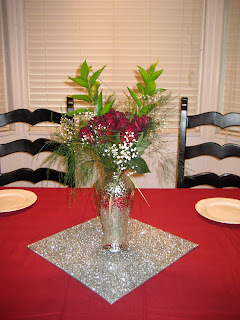 We called and after hearing that filet mignon, chicken picatta, and veal marsala were on the Valentine's menu I was hooked. Unfortunately, despite rave reviews from friends and family who have been there, Tuscany did not live up to our expectiations. We ordered filet mignon, only to be told a 1/2 hour later they had run out. After finishing our soup we waited 45 min before the next course arrived. After waiting for dessert we were told that they had run out of that too. All in all the service was bad, they were underprepared for a big fancy restaurant day like Valentines, and our 9:00 reservation had us finished with our meal after 11:00. I kept imagining what a special meal I could have made at home for a fraction of the cost, and thats exactly what I plan to do next year. And that was the conclusion of our Moroccan, Peruvian, Italian-American dining Valentines. Sure, we look happy enough...but I can still envision the empty dream of what could have been with dinner at home. Mix dry ingredients in a large bowl or mixer. Add water, and mix to form a dough. Add more water/flour if necessary to make a soft dough you can knead. Knead 5 min until smooth and elastic. (The mixer works fine). Pour a little oil onto a cookie sheet, take balls of dough and using the oiled surface with oiled hands spread out dough and push down to a thin square shape, thin as possible (1/8”), don't worry about the oil, there was no fat added to the dough, so be generous. Cook on a hot ungreased skillet. After cooking one side spread the nutella or cheese on the cooked side, fold up in 1/3s and eat hot. It'll taste better if you go to Morocco and have a lady on the street make it for you, but since most of us can't do that very often, this is pretty good too. Sorry to hear that the dinner experience was not what you'd hoped for...Blake and I had that same kind of experience a couple years ago when we went out on Valentines. Our waitress was awful, the food took forever to arrive, and we were just glad when the meal was over! 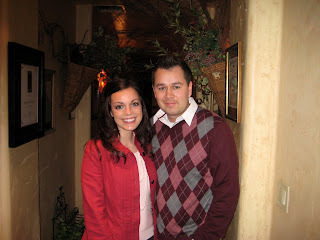 Anyway, love seeing the pictures of you and Brad in your Valentines colors. Look forward to seeing you guys next Saturday!